There really was only one competitor that rose head and shoulders above the rest in the category of pda gps devices. Our one and only finalist, and winner — Garmin iQue 3600. Garmin iQue 3600 — The BEST GPS The iQue 3600® is the first PDA to include integrated GPS technology. With the power of Palm OS® 5.2.1 and the dependability of Garmin® GPS technology, this "Super PDA" redefines multi-tasking. The integrated software not only allows you to look up appointments or contacts, but also locates and routes you to them with voice-guidance commands! If a handheld GPS seems out of your price range or maybe you just don't like the idea of carrying another digital gadget, you may want to consider putting that PDA to use. If you're already touting around a handheld computer, a good GPS solution may be closer than you think. A PDA will allow you to load and change maps for your needs, in addition to cross-referencing information with other handheld services such as Vindigo. Depending on your handheld, you probably can use a number of GPS receivers from Eagle, Garmin and Magellan. There are also a few specific receivers out there for individual handhelds. If you have a Palm III or Palm V handheld, there are special GPS receivers available. 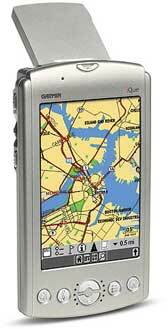 The StreetFinder GPS from Rand McNally, ($150) for example, is available for both Palm III and Palm V based handhelds. The StreetFinder is a GPS receiver that hooks onto the back of your handheld and features its own battery source. StreetFinder offers an all-in-one setup with no cables or wires. For Handspring handhelds, GPS receivers are still on the horizon using the company's springboard module interface.